"A wonderful novel, in the good old tradition, with intrigue, love, mystery and tender, audacious and well-drawn characters." 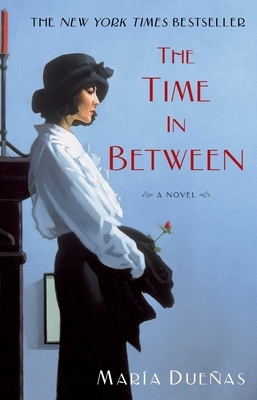 "The Time in Between is an epic novel with an unlikely Spanish heroine, Sira Quiroga, that takes us through one of the most turbulent times in Europe: the onset of World War II. Sira travels on a journey through romance, love, loss, and intrigue, all while discovering traits that she never dreamed she had. I couldn't turn the pages fast enough, and once I reached the end, I couldn't wait to start it all over again!" "Engaging, romantic, vivid and captivating. Who knew a story about a seamstress in Spain could be so intriguing and captivating? If you love thick, juicy female-led novels that sweep you away from all sense of time and responsibility, you need to read The Time In Between by María Dueñas." "Evocative, tender and lush; a wonderful experience of times and lives in turmoil." "Packed with engaging characters, flawlessly researched, and breathlessly paced." "It is no surprise this debut novel was a runaway success in Europe. American fans of historical fiction looking for a dramatic, uncomplicated escape will be similarly entranced." "From a terrific opening line to the final page, chapters zip by at a pulsing pace." "How can a novel be both cruel and tender, dark and luminous all at the same time, and keep the reader glued to its pages with a complex, captivating narrative? María Dueñas's novel manages to make this possible with a tale that is destined to become a literary classic." "An enticing debut novel from Spain, The Time In Between is luxuriously landscaped with exotic geographies and international intrigue. María Dueñas delivers a hefty book that's as smooth to read as the tailored lines of the haute couture her unforgettable protagonist creates."